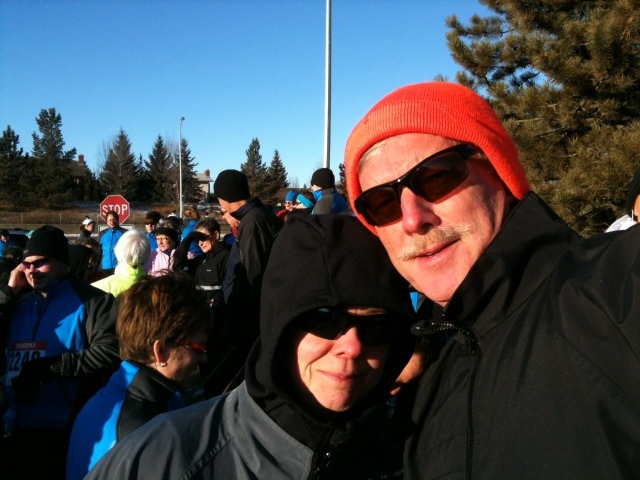 This morning Don and I joined a thousand or so other crazy people to walk 5 kms in the Brita Resolution race. It was a balmy -14C in Edmonton and I had on so many layers that I felt like the Michelin man. Despite the cold temps and the very ice-y trail, we finished in a respectable 46 minutes. We thought this would be a great way to start 2012 and a “warm up” for our half marathon in February. OMG!!!! You’re a better woman than I am….burrrrr… it’s going down to -15 here tonight and I am too chicken to BBQ the Filets…Grill Pan here I come…lol….Looks gorgeous and sunny though!